The words above are one of quotes that I like, Simple but very meaningful. It reminds me about one of experiences before getting opportunity to go to Europe. I learnt it from my friends who support me to never give up until trying the best that I can do although it seems no more possible at a glance. Yes…, box of chocolates, the box that wrapped in a beautiful and attractive look. everyone thinks that it’s really delicious in a taste because everyone likes chocolates. It’s rarely to find a person who doesn’t want chocolates that wrapped in an attractive look. But we don’t really know the real chocolates are. 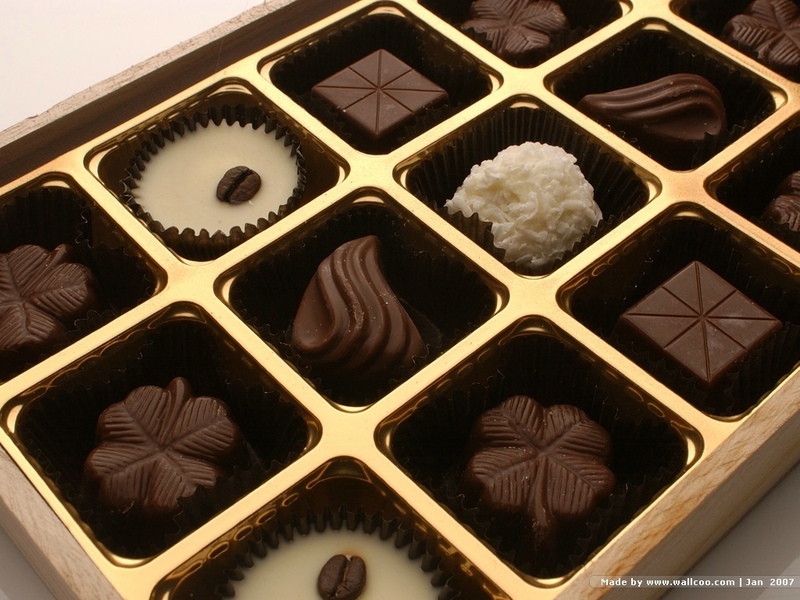 We need to open the box to make sure that the chocolates itself is really delicious. You need to see the chocolates directly to know how it looks like. But..it’s still not enough to judge the chocolate is. It can be truly delicious or not. You need to prove it with trying the chocolate one by one then you will know how the taste is. don’t be fooled by outward appearances. It’s not always that the chocolate which has a good appearance, has a good taste and it’s not always that the chocolate which has a bad appearance, has a bad taste. It can be happened that the chocolate has a bad appearance but has a good taste- “never judge a book by its cover :p-. After that you can really know how the good of chocolate is. It’s like what I’ve done to reach one of my dreams (go to Europe before taking my graduation day). First of all, when I saw a publication of call for paper related to energy in Germany, I was glad because It will be my chance to get there (I thought) even I only little know about the topic itself. Actually, in my condition, I must ask to other who have good knowledge about this topic and ‘blend’ it with my knowledge. unexpected, my paper was approve at last (here, I’ve got the box of chocolates). Then…the problems come such as permission from campus, proposals, and the big problemà funds. I only have a short time to manage all of those things because The information came lately to me. Then I must go to Thailand the day after I got the information. I thought that’s impossible for me to get there because I can’t prepare it well. I thought that “it’s enough to send my full paper and published by them even I can’t go there” (hopeless). But I have friends that support me to do the things all out. After that I did something with doubt. I thought that I can’t done it when I was still in Thailand. But my friends told me to request the ‘special’ permission even I wasn’t expecting too much. Unexpected, The commite gave me a chance to send my full paper after I came back to Indonesia. After that, the next problem is how to collect the funds. I thought so hard how to get it. First I must come to campus and take the permission from campus but that’s not going well because the other team have taken the permission so it made me hard to get the permission itself. Without the permission I can’t find the sponsor and my request for visa won’t accepted. Here, my friends help me again to make sure that everything goes to the plan (here, I didn’t really know how effective our effort and I didn’t know what will happened, I just tried it). One thing that almost made me give up is funds. I need a lot of money to go there but until 7 days before went to Europe , I still didn’t get any sponsor. It’s really sad if I must let my dream goes away after I did like that. But I thought..it’s okey, I have taken some experiences. But I still must try with my friends to get the sponsor. unexpected, I got the sponsor and the money can be disbursed one day before I went to Europe. Then never judge before you try coz you don’t know the chocolates until you open the box of chocolate and try the taste of chocolates…. 2. Dardiri yang uda nge-support gw buat ngirim paper yang gw kira paper gw bakal ditolak dan meminjamkan tempat menginap sehari sebelum pengumpulan abstraksi paper. bagus liat foto2nya yg di fesbuk! makasi man,, SMANGAAAT juga boz!, tolong bimbingannya di dunia per-Blog-an, he…. hehe… makasih juga ph, hehe.. Gift Baskets For the Holidays?